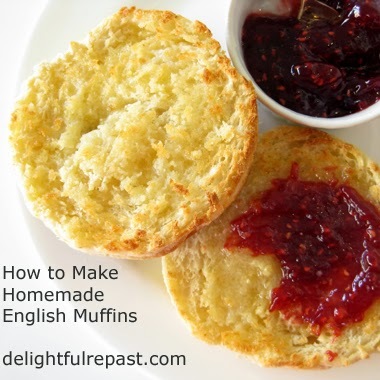 Recipes for what we outside the UK call English muffins appeared in print as early as 1747, called simply muffins. 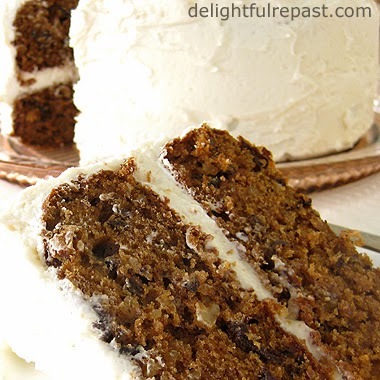 One such recipe was in English cookery writer Hannah Glasse's The Art of Cookery. What they in the UK at one time called American muffins have become so popular in the UK that they are merely called muffins, leading to some confusion. 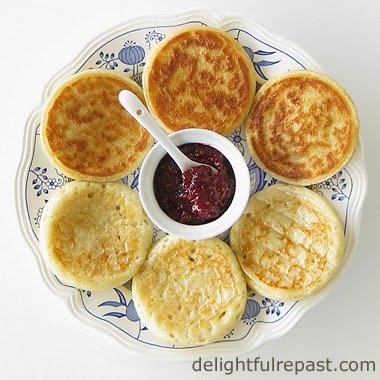 So much so that some British cookery writers and UK brands have taken to using the term English muffin. 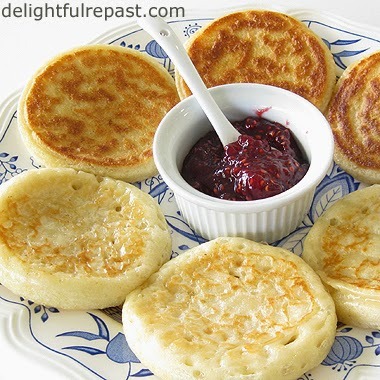 Some people bake English muffins in the oven, others on a griddle. Some use crumpet/English muffin rings, others do not. Some make a dough and roll it out and cut it like biscuits, others a looser dough, bordering on a batter. My method calls for patting pieces of soft dough into 3.5-inch rounds and placing the rounds in rings. Why do I use the rings? Call me fussy, but I like the whole batch of whatever I'm making to look as identical as possible. Dividing the dough equally and using the rings makes that happen. And the rings make the dough rise higher, rather than spreading. To make 12 muffins, double all recipe ingredients except the yeast. If you'd like to make 6 one day and 6 another day, double the recipe, divide the dough and refrigerate half. 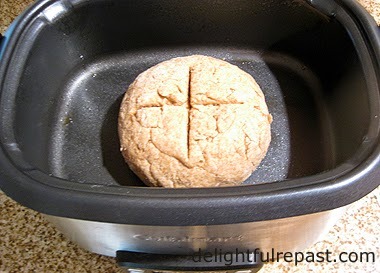 When ready to cook the second half of the dough, bring it to room temperature, about 2 hours, then proceed as before. I know I probably post (and eat!) too much bread, but I can't help myself! If you like this post, please share it on Google+, Facebook, Pinterest, Twitter and any other social media you're on. And do leave a comment below; I love hearing from you! 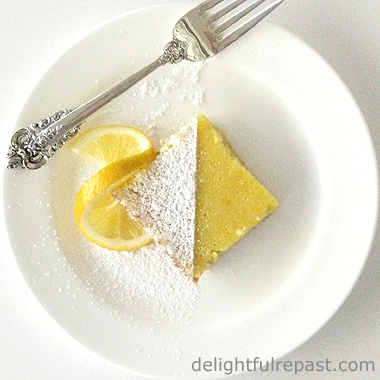 1 In 2-quart bowl, whisk together 1 cup flour, sugar, yeast and salt. 2 Heat milk and butter to 120 to 130 degrees. 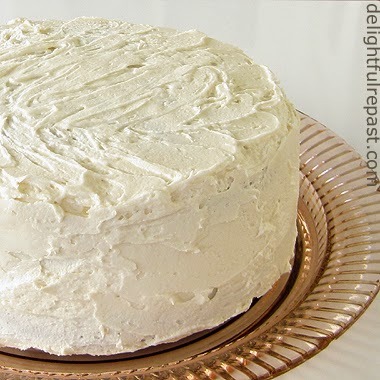 Stir gradually into flour mixture, making a smooth batter. Beat for 3 minutes. 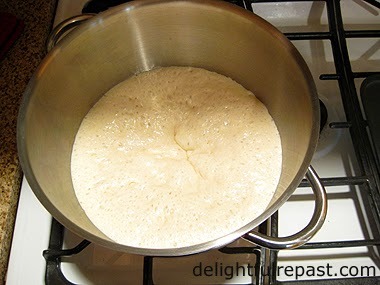 Gradually beat in remaining 3/4 cup flour to form a soft, slightly sticky dough. Sprinkle very lightly with flour and knead gently, right in the bowl, for a minute. Cover and let rise until doubled, about 1 to 1 1/2 hours. 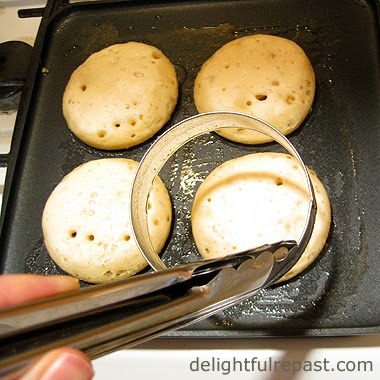 3 Brush with the melted butter six 3.5-inch / 9-cm crumpet rings and (very lightly) the griddle (I use an All-Clad nonstick griddle). 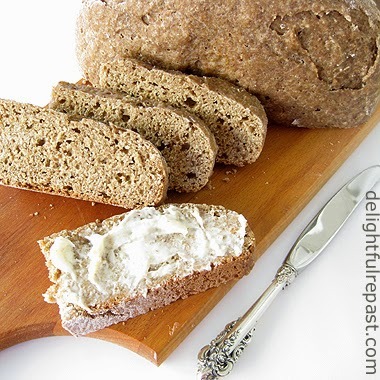 4 With greased hands, shape dough into an even log and divide into 6 equal portions (about 2.75 ounces or 78 grams). Shape into smooth balls and pat into 3.5-inch rounds. Roll in cornmeal to coat evenly. Note: If you like to be quite precise, as I usually do, weigh the finished dough and divide by 6. 4 Place cornmeal-coated rounds inside rings and press dough to fit rings. 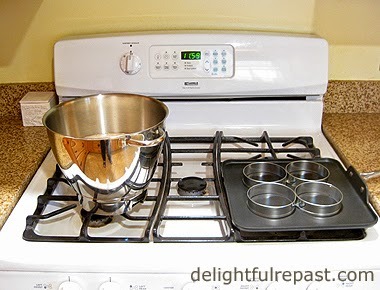 Spray a rimless baking sheet with cooking spray, and place upside down over rings. Let rise about 15 to 30 minutes, until puffed and risen nearly to top of rings. Don't let them overproof. Note: You can make these without the rings, but the muffins will have a more irregular appearance. Buy the rings; they don't cost much. 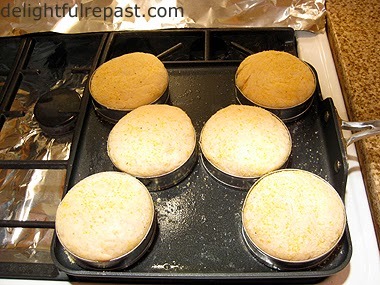 5 Set the muffin-filled griddle over very low heat and cook the muffins slowly for about 10 minutes until browned. With tongs, remove the rings. Turn the muffins carefully and cook slowly for about 10 minutes until second side is browned and muffins are cooked through. An instant-read thermometer inserted into the center of the muffin horizontally should register 200 degrees. 6 Cool on wire rack. Then split with a fork, toast and serve. 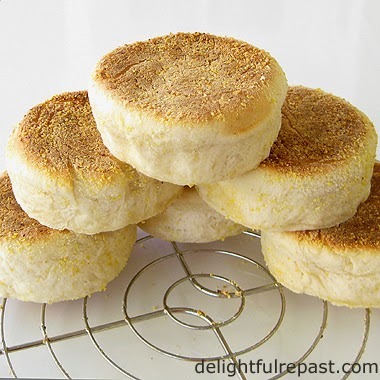 Splitting with a fork, rather than cutting with a knife, will preserve the nooks and crannies, the unique texture of the English muffin.